Terrell hosted the Mabank Panters Thursday night and won 6-1. Everything went right for Terrell, great pitching, great fielding and timely hitting. I will have some you tube clips loaded but probably not until Sunday. The sky was pretty hazy, they are saying it's from the brush fires west of the metroplex. The Tigers are one more step closer to the playoffs. 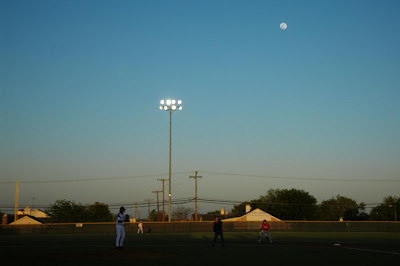 For Skywatch Friday, I am posting a view of the full moon over left center field on Tuesday night in Mesquite, Texas.